I have written about organ meats before. They are nutrient dense and should be on everyone’s menu at least once or twice a week. Chicken liver is one of my favorites. This recipe takes sautéed liver and combines herbs and other ingredients into a smooth and spreadable appetizer or main course. I love to eat it with a spoon, but most may beg to differ. It is a great spread on celery sticks or cucumber slices. 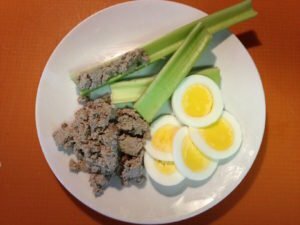 As optional ingredients, you could incorporate some healthy mayo and chopped hard-boiled eggs into the pâté to create a softer spread with added texture. Personally, I love the pâté just by itself.